Rec’d yours of Jan. 16, 17 & 19 today. David is taking a nap just now, I have lunch cooking and thought I would write the daily line while I have time to sit and think. That is quite a job when David is awake and going. It seems to me he is much more restless than either J. or M. Before this last cold I could pen him up in the nursery and get something done in the mornings, but last week when he had a temp I kept him on the couch and was with him constantly, consequently he doesn’t want to be alone now. This morning I finally put him in his bed and he went to sleep. I was getting along fine on the thumb business until last week and not wanting him to cry when it caused him to cough, let down on the breaking business and the past two days he has been keeping a thumb in his mouth almost constantly. I pin his sleeves shut at night so he can’t get to them at night but the first thing he does when I take his sleepers off if to stick either one or both thumbs in his mouth. I have one thumb guard on today so he is using the other thumb. I took him out for a long walk yesterday. It was so warm out I knew it wouldn’t hurt him. He still coughs but so many people do. There must be a cough bug around this year. [page 2] John is coughing now. He told David he got a cough from him. I think John’s cough may be an allergy. He had one such last fall. When I took him to Dr. V. he said it was hay fever. John went back to school this a.m. after taking yesterday p.m. off. He had a terrible headache but it was due to reading a book & writing a review – working too constantly on it. He reads all the time but not quite as steadily on this book. The way he like to read it, is too bad his eyes bother him. However, I wish sometimes he would get out a little more. I think he would be happy just to study all the time without any activity and that isn’t normal. I am glad he has to take physical ed. in school. Mark on the other hand studies just as little as possible and is always ready to play something out of doors. He gets out in the yard and kicks his football around if he doesn’t have anyone to play with. It has been so warm the past week, yesterday was just like a spring day. It is too dry for the good of crops in the spring. The government is already predicting crop shortages next summer, or if not shortages, the crops won’t come up to last years. We haven’t had much snow or rain either this winter. Of course this is easy on the present coal supply but that isn’t all to think about. I do hope they get in more of the better coal but am afraid they won’t. I think we have enough yet to run us thru the coldest part of the winter, providing we don’t have an unusually cold March, which we may have since it is so warm now. [page 3] The Democrat had the acc’t of Mrs. Kindall’s death. I didn’t know she was ill but the paper says she had been down two weeks. She used to stop and visit with me once in a while, and had been here not so long ago. I suppose it was her diabetes. Bun Walkup hauled the clinkers yesterday. I had been trying to get him to get them for weeks. We had quite a pile, due to that Ind. coal we used in Nov. He says he will have to go in Feb. for his physical. He thinks he won’t pass. I told him he probably would. He seems to think he has enough wrong with him to keep him out but apparently he is enjoying good health. Had a letter from Juanita. Ralph is in the Navy now. He was due to go in the Army but joined the Navy instead. She also told me Aunt Minerva had passed away – I don’t know when – the family didn’t let me know. I sent Aunt M. a birthday card (Nov. 14) and I had a letter from her after that but that was the last I heard from her. – – It is afternoon now. David is awake, has been fed and in and out of everything he can find. I finally penned him up in the nursery and he is now dragging his bath towel around to amuse himself. His favorite place to play is the downstairs bathroom. He had his nap this morning so is full of pep for the afternoon. [page 4] It is raining now. I hope we have more and tho I don’t care for cold weather, would rather have it now than later in the spring. While walking yesterday met Mrs. Krull. She had been with Louise, but Father Krull died and after attending the funeral in Ohio, Mrs. Krull decided to remain home. I told her D. had a cough – She said “Are you greasing him?” I said “What good would that do?” She said “You young mothers.” – She related some experiences at Louise’s about using some home remedies on the new baby – of course on her own – Louise doesn’t share her mother’s belief in the curative powers of goose grease, etc. She said I should use goose grease on David. Margaret Kruman is taking her yearly vacation in Fla. I see in the paper that Mrs. Shandy & son have gone to Miami to join Cliff. I imagine Marg. went with Mrs. S. – They both left Monday. Also Mrs. Dixon & Nettie have gone and I saw in last week’s paper that Mrs. Dye, son Ross & Gladys Webber had gone to Fla. together. Lucile just called and while we talked D. went from one thing to another, the last thing he did to get me to stop talking was get some bread out and scatter it over the floor. Lucile was having similar trouble with J.E. David is being unusually – whatever you want to call it today. This entry was posted in Foster, Genealogy, World War II, World War II Letters, Yegerlehner and tagged Bernard "Bun" Walkup, Cliff Shandy, David A. Yegerlehner, Dr. Van Buskirk, Gladys R. (Foster) Yegerlehner, Gladys Webber, Jimmy Ed Johnson, John F. Yegerlehner, Juanita (McCammon) Richards, Louise Krull, Lucile Johnson, Margaret (Servies) Kruman, Mark A. Yegerlehner, Mary E. (Van Dyke) Hartsook Kindell, Mary Josephine (Ramp) Krull, Minerva (Lawhead) (Riggs) Metcalf, Mrs. Dye, Mrs. Shandy, Ralph Richards, Roscoe S. Yegerlehner, Ross Dye on November 2, 2015 by Deborah Sweeney. Final rites were conducted from the Hufty-Crane funeral home here for Mrs. Emily H. Foster, 71, Sunday at 2 p.m. with the Rev. V. B. Servies in charge. She died at the St. Elizabeth hospital in Lafayette Friday after a three months illness. Born at Robinson, Ill., she was married to James E. Foster, in 1894. Surviving are three sons, Jesse, of Arkansas; Glenn, of Nevada, and James, USN, at Norfolk, Va., a daughter, Mrs. Gladys Yegerlehner, of Kentland, and a sister, Mrs. Minerva Metcalf, West Union., Ill. She was a member of the Methodist church. 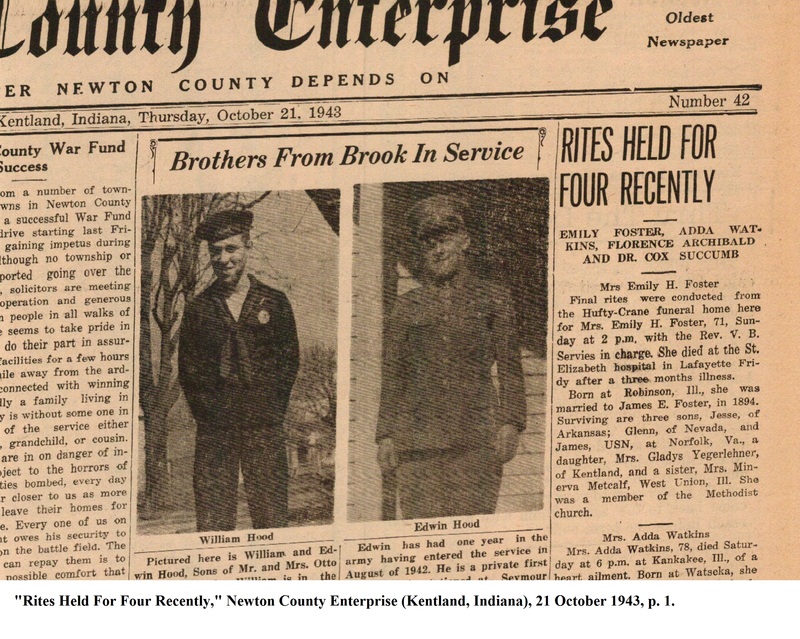 “Rites Held For Four Recently,” Newton County Enterprise (Kentland, Indiana), 21 October 1943, p. 1. 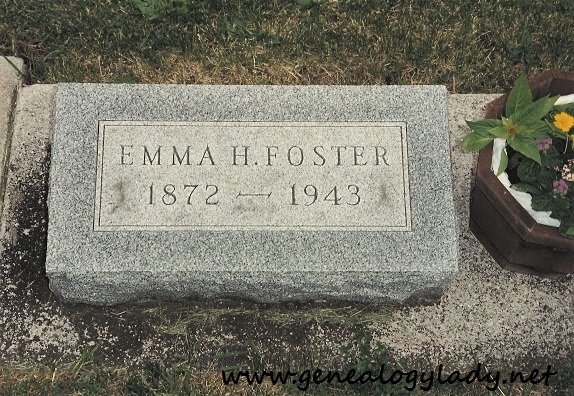 Emma was buried at the Fairlawn Cemetery, Kentland, Indiana. You may visit her memorial at Find A Grave. This entry was posted in Foster, Genealogy, World War II, World War II Letters, Yegerlehner and tagged Emma (Lawhead) Foster, genealogy, Gladys R. (Foster) Yegerlehner, Glenn E. Foster, Indiana, James E. Foster, James L. Foster, Jesse Roy Lawhead, Kentland, Minerva (Lawhead) (Riggs) Metcalf, Newton County Enterprise, Rev. 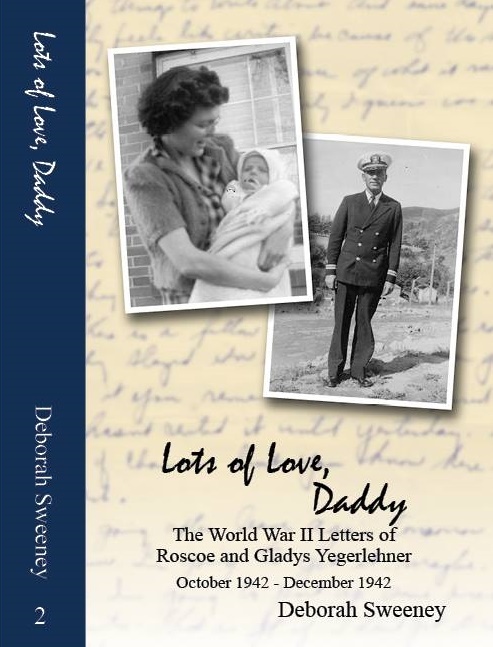 Voris Servies, World War II, World War II letters on April 16, 2015 by Deborah Sweeney. 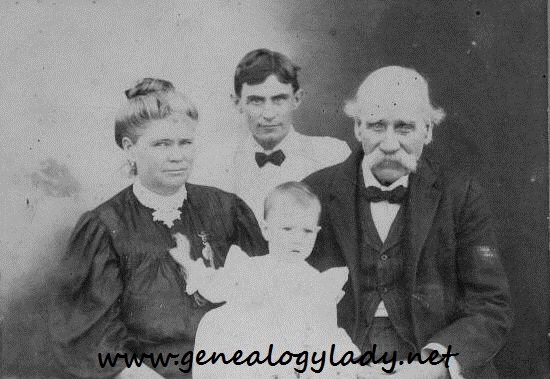 Friday’s Faces of the Past – Family Funeral? The three above pictures appear to have been taken on the same day. The two single portraits were clearly taken at the same location. The group photo shows Gladys and the older woman wearing the same clothing as their individual pictures. Everyone appears to be wearing black or dark colors. Hence my assumption that the photograph was taken around the time of a family funeral. I date the picture circa1925. Gladys was born in 1905 so she would have been 15 in 1920 and 20 in 1925. Gladys’ haircut is straighter and less wavy than it was later in the decade. Her skirt length is short which moves the date further from 1920. 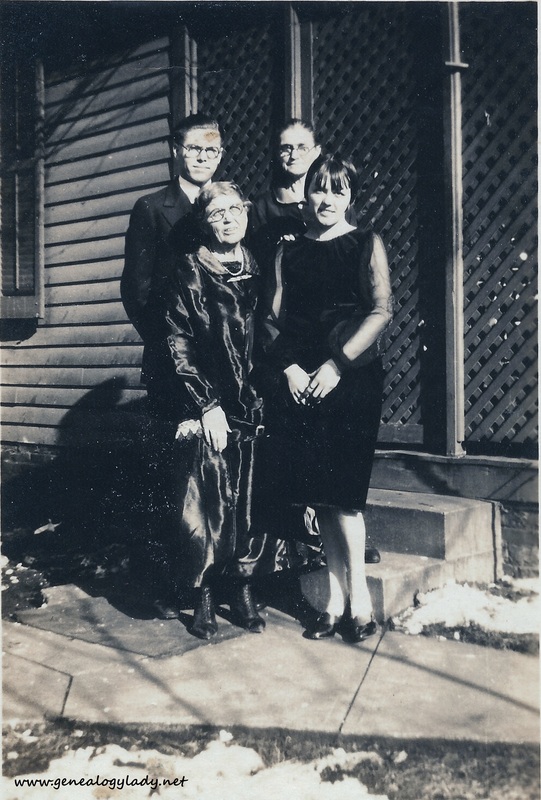 The older woman is wearing a dress styled from the late teens. It was quite common for older people at that time to wear clothes that were more “old fashioned.” Even today the trend continues. Many years ago I sent a copy of the picture of the older woman to my father’s cousin. She identified the woman as Minerva, Emma’s twin sister. Since the cousin knew Minerva, I generally take her word for it. However, I still say “the older woman,” because I am not 100% sure that she was Minerva (Lawhead) Metcalf. I have only seen two pictures of Minerva and they are of a somewhat younger woman. The earlier photograph was taken about 1908 and Minerva was plumper and would have been about 36 when the picture was taken. 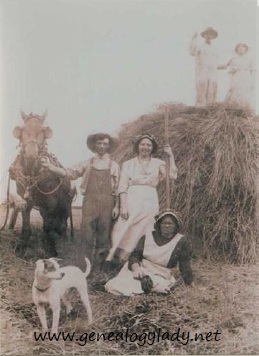 The second photograph was taken about 7-10 years later between 1915-1919. Again the picture shows Minerva with a fuller figure. Minerva would have been in her early to mid 40s at this point. Which brings us back to the pictures at the beginning of the post. Do you think that the older woman is Minerva? She seems to have aged too much to be in her 50s. But times were different then. For someone who did hard manual farm labor, they could have aged more harshly. I know she is related to the Foster/Lawhead family. She bears a striking resemblance to Jim Foster (Gladys’ brother). When my grandmother was near her end and Alzheimer’s had robbed her memory, she thought the picture was of her brother Jim. So what do you think? 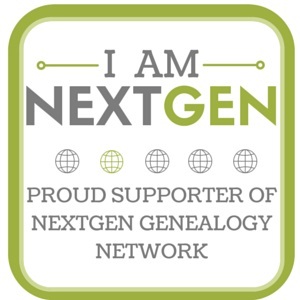 This entry was posted in Foster, Friday's Faces From the Past, Genealogy, Lawhead and tagged Emma (Lawhead) Foster, genealogy, Gladys R. (Foster) Yegerlehner, James L. Foster, Jesse McCammon, Lydia Allie (Foster) McCammon, Minerva (Lawhead) (Riggs) Metcalf on November 29, 2013 by Deborah Sweeney. This entry was posted in Foster, Genealogy, Lawhead, World War II, World War II Letters, Yegerlehner and tagged Arlene Funk, Dr. Ira Cole, Edward Metcalfe, Emma (Lawhead) Foster, genealogy, Gladys R. (Foster) Yegerlehner, Jack Riggs, James B. Riggs, James Roscoe Riggs, John F. Yegerlehner, Kenny Jones, Kentland, Link, Mark A. Yegerlehner, Menona Belle (Metheny) Riggs, Minerva (Lawhead) (Riggs) Metcalf, Norma Zell, Roscoe S. Yegerlehner, World War II, World War II letters on March 4, 2013 by Deborah Sweeney.